Ashkenazi Jews were often very poor. If a family was able to acquire a chicken for Shabbat, they used every part of it: standard dishes included chopped liver, helzel (stuffed chicken neck), gribenes (crackling made from fat and skin), pupik (roasted gizzards), p’tcha (chicken feet) and, of course, schmaltz (rendered chicken fat used for cooking). The remaining carcass would be used for what has become emblematic of Jewish comfort food, chicken soup. 1. Gather the fresh dill, cilantro, garlic cloves, onions, celery and parsley sprigs in a piece of cheesecloth to form a purse; secure with twine. Make a second purse with the carrots, turnips and parsnips. 2. Put the dill purse, chicken, chicken feet, salt and 1-1/2 gallons of water into a large pot and bring to a boil. Reduce heat to medium low and simmer, covered, for about 1-1/2 hours. Add the carrot purse and simmer gently, covered, until the carrots are tender, about 30 minutes. 3. Remove and discard the dill purse and chicken feet. Transfer the chicken and carrot purse to a plate and let cool. Pull enough breast meat into fine shreds to make ¾ cup. Reserve 1 cup of the vegetables from the carrot purse. Cover and chill the shredded chicken and vegetables (Reserve the remaining chicken and vegetables for another use). Set a fine mesh sieve over a large bowl and strain the broth; chill overnight. Skim off and discard all but 2 tablespoons chicken fat from broth; set fat aside. 4. Whisk together the reserved chicken fat, club soda, dried dill and eggs in a bowl. Pour in the matzo meal while whisking. Cover and chill the matzo mixture for 15 minutes. 5. Bring 2-1/2 quarts salted water to a boil over high heat. With wet hands, form the matzo mixture into 1 inch balls. 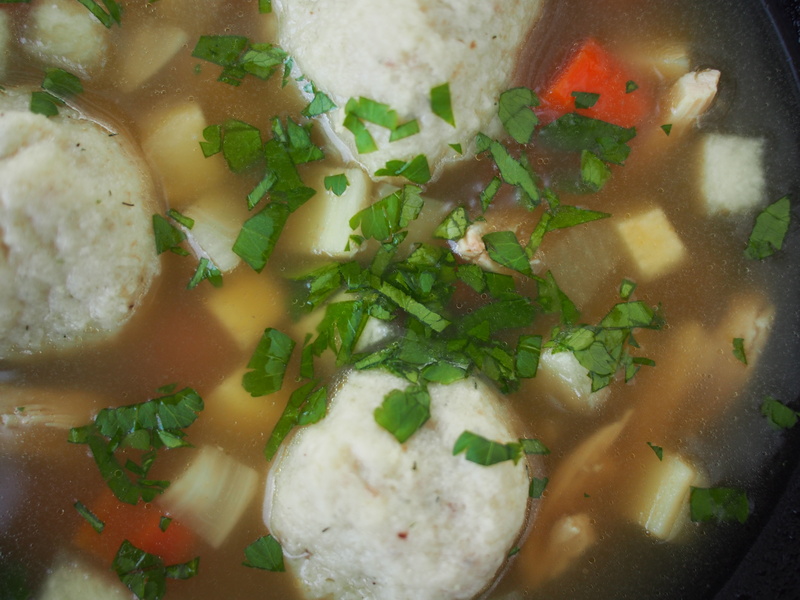 Reduce the heat to medium and drop in the matzo balls. Cook, covered, for about 15 minutes. Stir the matzo balls gently and simmer, covered, until fluffy, about 20 minutes more. 6. Meanwhile, transfer the reserved shredded chicken, vegetables and broth to a large pot and heat over medium heat. 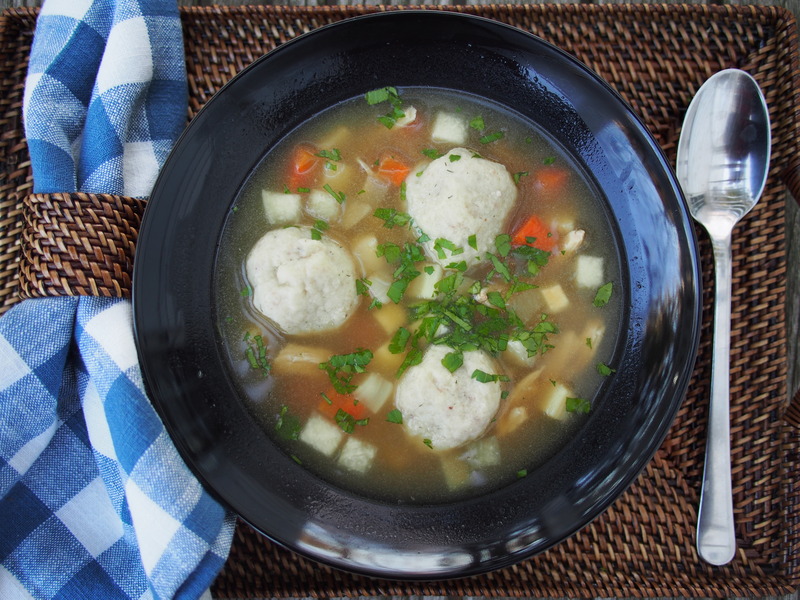 Transfer the matzo balls to the broth. Serve the soup garnished with chopped parsley.